What Colors Resonate with You? 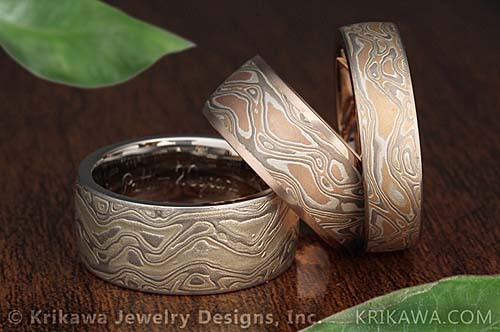 Krikawa offers eight different color combinations for you to select for your custom mokume ring. Combining gray, rose and yellow gold with sterling allows for a distinct and earthy textural contrast. The Trigold Mokume is the only variation without sterling, making it glow with the warmth of a full palette of golden hues. All of the different types of mokume that we offer are custom made. We hand pattern each piece of mokume by a very time consuming process, ensuring that each ring made with the mokume will have a detailed and consistent finish. 14 karat palladium white gold and sterling create a beautiful white and gray mokume. A classic favorite. 14 karat palladium white gold, 18 karat rose gold and sterling combine to form this light and airy contrast of metals. This unique mokume combines 14 karat palladium white gold, 10 karat green gold and sterling. Best etched to delineate the contrast of metal colors. 22 karat yellow gold, 14 karat white gold (gray) and sterling combine to create a rich yellow gold contrasted with a medium gray. Best etched to delineate the contrast of metal colors. 18 karat yellow gold, 14 karat white gold (gray), 14k rose gold and sterling. Best etched to delineate the contrast of metal colors. This is a solid gold mokume. It is made of 18k rose, 14k palladium white and 18k yellow gold. The color difference between these metals is very subtle. If chosen, a matte surface provides the highest contrast. Platinum is "iced" with sterling in this cool mokume formula. Platinum and darkened (oxidized) sterling silver create the ultimate contrast of colors.